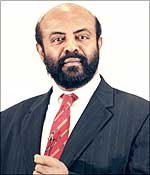 Shiv Nadar is an Indian businessman and educationalist. He is the current Chairman and Chief Strategy Officer of HCL Technologies. Nadar, known as Magnus (Wizard in Persian) amongst his friends, founded HCL in 1976 along with Ajai choudary and three more colleagues. Today, HCL is an IT Enterprise consisting of HCL Technologies, which focuses on Software and IT Solutions and HCL Infosystems, which focuses on Hardware manufacturing and product reselling.A native of Moolaipozhi village in Tuticorin District (Tamil Nadu) he graduated from PSG College of Technology. Nadar started an engineering college - SSN College of Engineering in 1996.Forbes has been listing him in the Top 500 Richest people in the World and Top 40 Richest Indians since 2000. In 2007 he is ranked 214 in the world at Forbes list of billionaires.